While some foals are born with contracted tendons, a painful and debilitating condition that can affect more than one joint, other foals or adult horses can develop it later in life. 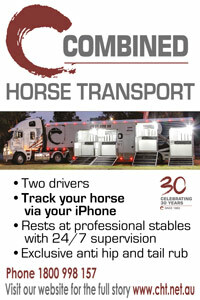 A horse is said to have ‘contracted tendons’ when it is unable to fully extend its limb to the normal position. 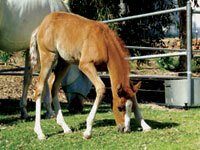 It’s a common problem in foals and may be present at birth, when it is referred to as ‘congenital’. 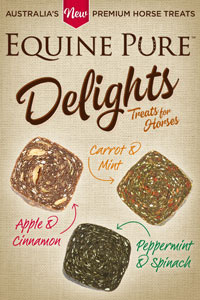 can develop later in the life of a foal or adult horse and is then referred to as ‘acquired’. Colloquially referred to as ‘contracted tendons’, it is important to realise that in a lot of cases the tendons are not actually contracted, they are just functionally shorter than the bones of the limb – due to the rate of growth in the bones and tendons differing, which causes a tightening effect on the tendons. As a result, a more correct name is flexural limb deformities. As a horse’s tendons are fused to different joints, several joints may be involved: the coffin joint, fetlock joint, the knee and sometimes, but rarely, the hock. The forelimbs are more commonly affected and the deformity may be present in more than one limb at a time. This article will focus on the acquired form of the disorder. 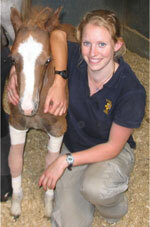 When the condition occurs in newborn foals, some cases will resolve as the foal exercises. 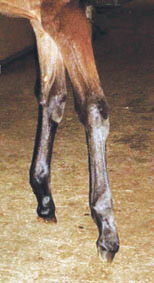 In the case of flexural deformity of the coffin joint, the foal’s heel does not touch the ground. This causes pain in the toe region and tension in the deep digital flexor tendon, which makes the foal reluctant to bear weight, thus exacerbating the problem. In fetlock and knee flexural deformities, the joint buckles forward, decreasing the normal tension on the tendons and allowing them to contract even further. Thus deformities tend to become self-perpetuating and can quickly change from mild to severe, complicating their treatment. Another point to bear in mind is that whilst new-born foals have surprisingly pliant tendons, they quickly stiffen up. Early treatment of flexural deformities significantly improves the chances of a successful outcome, and usually increases the speed at which this happens as well. Any painful condition in a leg can cause the foal to weight bear on the opposite leg, which over time can cause the tendon to contract. The foal left is using the off side leg for weight bearing and the near fore is already exhibiting signs of contraction with the heel held off the ground. The reason this deformity develops is not always clear cut and straight forward, but there are several pathways that may be involved. The majority of acquired flexural deformities are related to growth patterns and tend to occur when there are periods of rapid skeletal growth, which may be influenced by nutrition and genetics. While the skeletal structure of the young horse may adapt to the rapid growth rate, the problems occur because the potential for rapid growth of the tendons is limited and flexural deformities develop due to these different growth patterns. Tendon growth is constrained by structures known as accessory or check ligaments that are made up of dense fibrous tissue and attach the tendons directly onto bone. 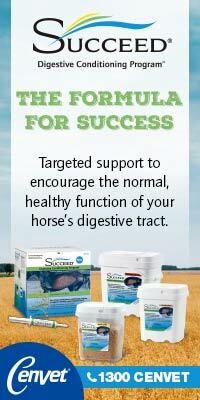 Their function is to provide extra support to the tendons that support the fetlock. Due to these differing growth patterns, flexural deformities can occur in different tendons and subsequently different joints at different times. Nutrition is also thought to play a significant role in the development of these deformities. 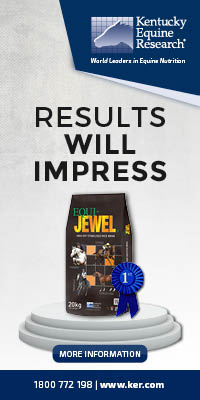 Over-feeding or an excess of nutrients in foals that are naturally predisposed to rapid physical development is a common finding in affected foals. The condition may also be genetic or secondary to other problems such as any painful condition in the limb, which results in a flexion withdrawal reflex. 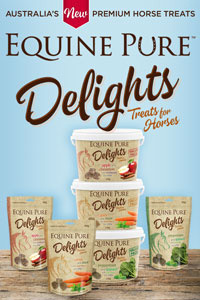 Painful conditions such as infectious joint disease, trauma to bones or the soft tissues, or hoof problems, may lead to favouring of the limb, where the horse avoids bearing as much weight on it. 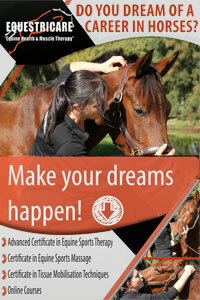 The result being that the muscles not used then contract, which leads to the horse having an altered stance. These deformities may become permanent and debilitating - even after the original injury has resolved - if the horse is not managed with pain relief, physiotherapy and controlled amounts of mild exercise. When pain is involve in the development of this deformity is it common to see just one limb affected, unlike incidents associated with rapid growth, nutrition or genetics, which affect both limbs to a varying extent. 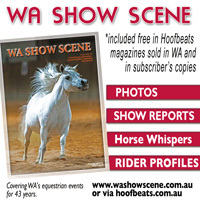 A good understanding of normal conformation combined with careful examination of the young horse will enable early recognition of the problem, which is preferable as the treatment is less complex in mild, early cases. Signs of acquired flexural deformity in the coffin joint that can be identified early are a pointed toe stance that progresses to an increased height of the heel relative to the toe as the toe is worn down. This occurs when the pull of the deep digital flexor tendon (DDFT) on the back of the pedal bone makes the angle running from the coronary band to the toe become closer to vertical rather than at the normal 50° angle. 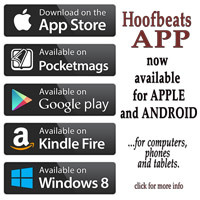 Progressively the heel and toe end up the same length, giving the hoof a characteristic, ‘boxy’ club foot appearance. 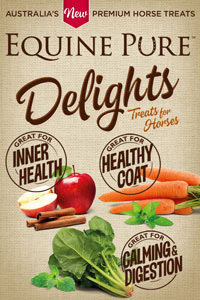 Other signs to look for include the inability of the horse’s heels to touch the ground after they have been trimmed, and a prominent bulge at the coronary band. Horses with ‘boxy’ feet will often become lame after routine hoof trimming as the trim makes the heels bear more weight when they are lowered, placing more tension of the flexor tendons. Acquired flexural deformities of the fetlock joint are characterised by a nearly straight angle of the fetlock while the hoof itself remains in a normal position. still nursing, may be useful. 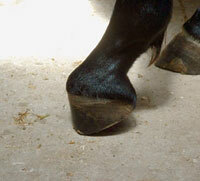 In cases of coffin joint flexural deformity, simply trimming off the excess heel of the hoof alone is not recommended. The club foot initially develops due to excessive wear at the toe and lack of wear at the heel, so gradual trimming should be combined with a toe extension. This not only protects the toe from wear but also helps to put more force on the tendons, which aids in their lengthening. 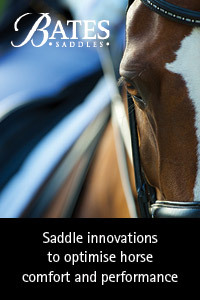 It is also important for affected foals to have a moderate amount of exercise to help put more tension on the tendons. This stretching of the tendons can be painful, creating a reluctance to exercise, so some foals may need anti-inflammatories for pain relief. For more severe deformities of the coffin joint, or where conservative treatments have been unsuccessful, surgical intervention is required. The treatment of choice for less severe deformities is to cut the accessory ligament of the DDFT. This procedure is relatively simple, minimally invasive, and may also be combined with toe extensions for a better result. 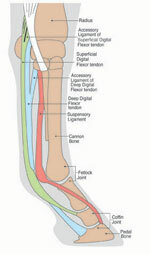 The coffin joint is affected when the deep digital flexor tendon pulls on the back of the pedal bone. other interventions have been unsuccessful. increase the tension on the superficial digital flexor tendon (SDFT). 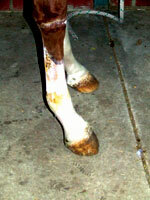 When the fetlock joint is affected it will appear nearly sraight while the hoof remains in a normal position. 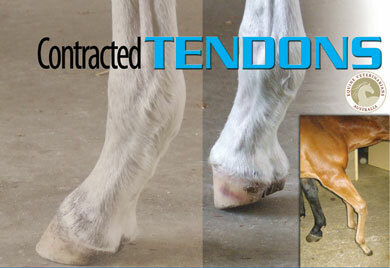 Depending on the tendons affected, some coffin joint involvement may also be seen with affected fetlock joints. 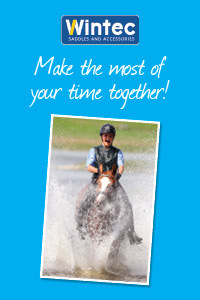 Physiotherapy in the form of hopping, where one leg is held up and the horse made to walk forward, has been recommended to help stretch the tendons. Splints may be applied to the fetlock to help hold it in extension but care must be taken with these to avoid pressure sores. Surgical management for more severe or unresponsive cases is more complex than the coffin joint as either the SDFT, the DDFT, or both, may be involved. The surgical option for less severe deformities of the SDFT includes cutting the accessory ligament, cutting the SDFT itself, and in severe cases, both of the accessory ligaments may need to be cut. When surgical intervention is required, the accessory or check ligament of the deep digital flexor tendon or the deep digital flexor tendon itself can be cut (arrowed) Note the ‘boxy’ shape of the near fore compared to this foal’s off side hoof. As the surgery healed and the foal bore weight on this hoof, the heels slowly spread and the hoof took on more of a normal appearance. 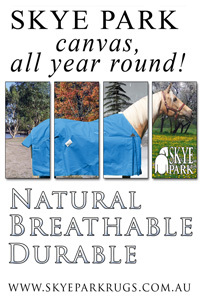 straight knee and athletic ability for those foals with milder forms of this deformity. recognise these problems as early as possible. 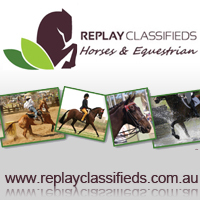 After attaining a degree in Veterinary Science at the University of Sydney Jennifer completed her internship at Goulburn Valley Equine Hospital in Shepparton Victoria. Having been a rider since the age of four, her future plans include a continuing involvement with the equine aspect of veterinary science.